Coco. A woman, a brand. Coco Chanel was born in 1883 and now, after almost 135 years, Chanel is still one of the most important brands in the fashion world! A recognizable, strong, elegant and modern brand. From straw hats to black sheath dresses and signature suits, Coco Chanel’s creations were absolutely revolutionary and marked the history of fashion. She broke all the rules and succeeded in capturing beauty thanks to her instinct and ideas. Coco Chanel understood the spirit of those times and revolutionized it by undermining preconceived opinions and making women free, independent and confident in their way of dressing. The brand reflects the rigour of her style: simple, minimal but elegant. Her use of black and white was absolutely revolutionary for those times and made the garments tasteful and austere. The brand logo is formed by two interlocked and opposing letters “C” on a white background. The font is a plain, unadorned Sans Serif, absolutely minimal and pure, as is the logotype, CHANEL. 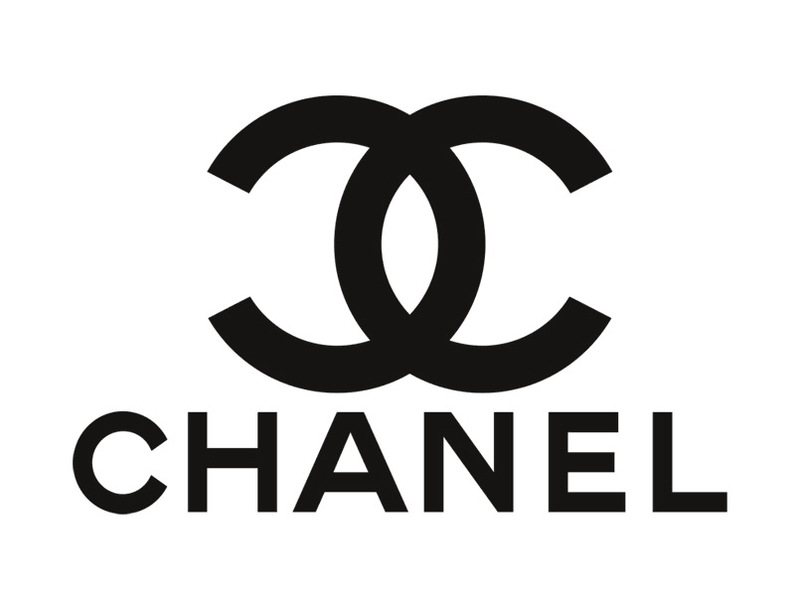 The Chanel logo is an example of simplicity, austerity and rigour. But it also expresses elegance and allure, and is therefore eternal. The double C logo was created in 1921 when the CHANEL N°5 fragrance was launched, and was designed by Coco Chanel herself. Although her real name was Gabrielle, she chose the double C thanks to the nickname, “Coco”, she had been given when just a girl. The the double C was also a hark-back to when she was a child. In the old family home, her great-grandfather Joseph Chanel was hesitant to carve his real initials (JC, as in Jesus Christ) into the furniture he made, so he decided to opt for the double CC. Thus the logo was a reference to Coco Chanel’s past, but it was to become world famous and to remain so for almost 90 years, so strong that it has become an inspiration for many other fashion brands, such as FENDI, GUCCI,etc. If you look at the photo of the other brands of that period you’ll see that the Chanel logo was already strong, eye-catching and incredibly modern. The packaging of the CHANEL N°5 fragrance is perfectly consistent with Coco Chanel’s style, thus revolutionary, unique and different from all the others. In 1921, scents were very colourful and the Art Nouveau style was a great favourite for packaging, but Coco eliminated all showy trimmings and created packaging that was as simple and plain as the logo. The box is a vertical rectangular shape with black lines printed around the edges and just the words Chanel N°5 in the center. Why number 5? Why did Coco choose number 5 as the name for this, one of the many fragrances created by Ernest Beaux, the famous perfumer? The box and bottle were slender in shape while the diamond shaped stopper of Chanel N°5 perfume was inspired by the geometry of Place Vendome in Paris, where Coco lived in a suite at the Hotel Ritz from 1931 until her death. The brand colours are 90% black and white and are the signature feature of Chanel style. They bring class, elegance and luxury to mind. The choice of these 2 colours is linked to the monastic rigour of the uniforms and white headgear worn by the nuns of the orfanage where Coco Chanel lived as a child. White is able to absorb the optical radiation it receives. White is the beginning of all colours. It is refined, tasteful and represents innocence. Black is also refined and attractive and, together with white, offers infinite possibilities even though the two nuances are diametrically opposite to each other. Their positive and negative effects are always extremely striking, eye-catching and selective. Nowadays, there’s a lot of interest in Coco Chanel, rich in concepts like liberation, emancipation, protofeminism, wisdom, allure (as in her website), with references to her past, her challenges, victories, pearls of wisdom. All these details form her personal history. Coco Chanel created a way of being a woman and over the years, her brand developed around her, her life, her values and her way of being. The Coco Chanel brand epitomizes the values of an independent, elegant, emancipated woman with whom all women wish to identify themselves and aspire to resemble. The Chanel brand now embodies values of beauty and inimitable style. On the morning of February 19, 2019, at the age of 85, Lagerfeld died at the American Hospital in Paris due to pancreatic cancer. Karl Lagerfeld has been at the helm of the fashion house for many years. Fashion genius, highly creative and versatile, he has succeeded in maintaining the brand’s elegant, chic heritage. Even today, when one chooses a Chanel product, one is still confident of having purchased elegance, luxury, sophisticated, up-to-the-minute style. Karl It leaves the Chanel fashion house in the hands of Virginie Viard. Agnese Angelini is a senior designer with more than fifteen years of experience in Corporate & Brand Identity. Tekoe, 100% natural Tea in Switzerland. Chili Box. Greek Frozen Yogurt!